Have you ever considered the immediate and overwhelming shock an unrepentant sinner must experience upon dying and finding themselves in hell? Oh, my! This thought has troubled my spirit for the past week. It’s hard for me to fathom how someone can be living on this planet, running around each day all for themselves, full of pride and selfishness, not knowing a thing about God (love), and then one short deadly breath later they’re thrust into hell. It must feel, literally, like a rug got pulled out from underneath them! Can you imagine those first few moments in hell, as the crushing weight of Truth hits them in a thousand enlightened thoughts? Uggh. "Truly God is good to Israel, even to such as are of a clean heart. But as for me, my feet were almost gone; my steps had well nigh slipped. For I was envious at the foolish, when I saw the prosperity of the wicked. For there are no bands in their death: but their strength is firm. They are not in trouble as other men; neither are they plagued like other men. Therefore pride compasseth them about as a chain; violence covereth them as a garment. Their eyes stand out with fatness: they have more than heart could wish. They are corrupt, and speak wickedly concerning oppression: they speak loftily. They set their mouth against the heavens, and their tongue walketh through the earth. And so God’s people are dismayed and confused, and drink it all in. “Does God realize what is going on?” they ask. “Look at these men of arrogance; they never have to lift a finger – theirs is a life of ease; and all the time their riches multiply.” Have I been wasting my time? Why take the trouble to be pure (obey God’s 10LC)? All I get out of it is trouble and woe – every day and all day long! If I had really said that, I would have been a traitor to your people. Yet it is so hard to explain it – this prosperity of those who hate the Lord. Then one day I went into God’s sanctuary to meditate, and thought about the future of these evil men. What a slippery path they are on – SUDDENLY God will send them sliding over the edge of the cliff and down to their destruction: an INSTANT END to all their happiness, an eternity of terror. Their present life is only a dream! They will awaken to the Truth as one awakens from a dream of things that never really were! Watch Video "NDE Hell is Real"
Approximately 838 Weeks (Sabbaths) Remaining Till Christ's Return! “Bad Evidence” for God’s Existence? Oh, my! My heart just sunk. It always does when I see a soul on Earth has had the cloak-of-deception pulled down so far over their head that they can no longer rationalize even the simplest of matters. Bad evidence! Are you kidding me? It’s all around us! It’s EVERYWHERE. And it is not “bad” evidence … it is INCREDIBLE! The physical world’s stunning complexity and breathtaking beauty absolutely prove the existence of a Creator God. Paul said it right: “For the invisible things of Him (God) from the creation of the world are clearly seen, being understood by the things that are made” (Romans 1:20). And what’s the godless alternative? To believe a single-celled organism somehow magically arose 2 billion years ago on this planet, having no concept of eyes to see, ears to hear, nose to smell, mouth to talk, arms to hold, legs to walk, etc. … with no clue of a body, head, bones, muscles, nerves, lungs, skin, heart, blood, etc … and it just started to divide and divide, with time and chance, and magically designed one of the most beautiful and complex creatures in the universe … YOU!!! Oh, and every other living thing you see, too! Come on. Seriously? This is on par with believing a chunk of iron ore, with time and chance, would figure out a way on its own to design and create a high-tech computerized Lamborghini. Preposterous! Yes, it is a sad day when a soul on Earth can no longer rationalize through something as simple as realizing “We are, therefore He (God) is!” I mean no disrespect, for my heart truly breaks for these people, but David said it best in the Bible about them: “Only a fool would say to himself, ‘There is no God.’ And why does he say it? Because of his wicked heart, his dark and evil deeds. His life is corroded with sin.” (Psalms 53:1, Living Bible). Approximately 839 Weeks (Sabbaths) Remaining Till Christ's Return! In the book I penned, God revealed the story of “Noah & the Flood” and the story of “Lot & Sodom & Gomorrah” are both prophetic stories about Jesus Christ’s Second Coming. In other words, their dual prophecies WILL BE fulfilled during Christ’s return to Earth! In each of them, God purposely controlled the events to spare (or save) one righteous house (family) of people above the destruction of all others. So too, at Christ’s return, will only one righteous house of people be spared (or saved) by rising up into the air while all others are destroyed on planet Earth. And what will be the final instrument of God’s wrath & global destruction during Christ’s return? FIRE, people ... FIRE!!! Although these truths are not spoken in modern day Christianity – a religion predominately overtaken by “doctrines of demons” in these last days – the Bible is crystal clear on this point. 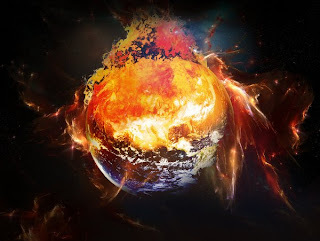 Peter wrote: “The day of the Lord will come as a thief in the night; in the which the heavens shall pass away with a great noise, and the elements shall melt with fervent heat, the earth also and the works that are therein shall be burned up” (II Peter 3:10). Now the Psalms are not a text one first thinks of as containing prophecy, but they do. They were there concerning Christ’s first coming, and Jesus even explained them to his disciples (see Luke 24:44-45). And they are there concerning Christ’ Second coming, too! And they confirm what I have written above: “Thou shalt make them as a fiery oven in the time of thine anger: the Lord shall swallow them up in his wrath, and the fire shall devour them” (Psalms 21:9); And “Our God shall come, and shall not keep silence: a fire shall devour before him, and it shall be very tempestuous round about him” (Psalms 50:3). No, it’s not pretty. And I’m sure it’s not politically correct. But I am here to soberly warn you that the place you stand, sit, or lay right now, as you read this blog, will be on fire in less than 20 years, for the WHOLE EARTH is going to burn! So if you’re still living in willful sin, it’s time (like none other!) to do some serious soul-searching and get right with God: “Seeing then that all these things shall be dissolved, what manner of persons ought ye to be in all holy conversation and godliness, looking for and hasting unto the coming of the day of God” (II Peter 3:11-12). Watch Video "Sodom & Gomorrah (A prophetic picture of Christ's Second Coming)"
Approximately 840 Weeks (Sabbaths) Remaining Till Christ's Return! The waves were rough and the disciples were scared. The boat was tossing back and forth in the night storm like a fish out of water. Would they live? Would they die? Then, all of a sudden they saw a figure in the distance – a ghost possibly! – walking calmly on the troubled waters. The terror. The confusion. 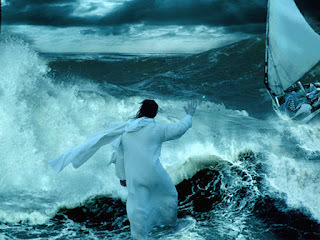 It was a miraculous night they would NEVER forget … the night Jesus tread on the waves of the sea and quieted the storm. A few short years later (having died on the cross and resurrected) Jesus frightened the disciples once again by appearing out of nowhere before them. But after convincing them that he was not a ghost, this time he had a powerful message to share with them: “These are the words which I spake unto you … that ALL things must be fulfilled, which were WRITTEN in the LAW OF MOSES, and in the PROPHETS, and in the PSALMS, concerning me. Then opened he their understanding, that they might understand the Scriptures” (Luke 24:44-45). Approximately 841 Weeks (Sabbaths) Remaining Till Christ's Return!